Blue Sky Flight Park is located about 30 minutes East of Richmond, Virginia .... and about 30 minutes South of Kings Dominion Amusement Park .... driving directions are listed below .... from a variety of incoming directions ..... a general map is at the bottom of this page. When driving to Blue Sky Flight Park, the use of GPS or Mapquest is rarely favorable, but if you must, the address of Queenfield Golf Course, which we are attached to, is 1896 Dabneys Mill Road, Manquin , Va 23106. The park is located about 15 minutes East of the Mechanicsville area, which is just east of Richmond , Va. If traveling from the NORTH from Wash DC or Northern Virginia, you can drive south on Route 95 . Take Route 30 East , which is the Kings Dominion exit. Travel east for about 21 miles, then make a right turn onto Route 360 west. Go 5 miles, and make another right onto 604 ( Dabneys Mill Road ). Then travel 2 miles and make a right at the Blue Sky sign ( brick house on the left ), also a sign for Queenfield Golf Course. Go one mile to Blue Sky. Parking area is after the last hanger, at the pavilion area. Then ,don't just sit in the parking area. Walk out into the grassy area, look to your right, and go to the hang gliders. If traveling from the WEST on Route 64 East toward Richmond, exit onto Route 295 South which will bypass the city of Richmond and take you to the east side of Richmond where you will exit onto Route 360 East towards Tappahannock. Then go about 11 miles and make a left onto route 604 ( Dabneys Mill Road ). Then travel 2 miles and make a right at the Blue Sky sign ( brick house on the left ), also a sign for Queenfield Golf Course. Go one mile to Blue Sky. Parking area is after the last hanger, at the pavilion area. Then ,don't just sit in the parking area. Walk out into the grassy area, look to your right, and go to the hang gliders. If traveling from the SOUTH or EAST towards the Richmond area, on 95 N or 64 W, take the 295 North beltway until you reach 360 East exit towards Tappahannock. Then go about 11 miles and make a left onto route 604 ( Dabneys Mill Road ). Then travel 2 miles and make a right at the Blue Sky sign ( brick house on the left ), also a sign for Queenfield Golf Course. Go one mile to Blue Sky. Parking area is after the last hanger, at the pavilion area. Then ,don't just sit in the parking area. 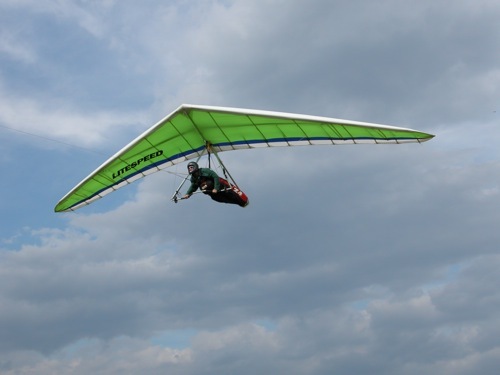 Walk out into the grassy area, look to your right, and go to the hang gliders.